Laszlo Birinyi will appear on Bloomberg TV tonight (April 30th, 2008) at 7:30pm to discuss the market, strategy and his view going forward. 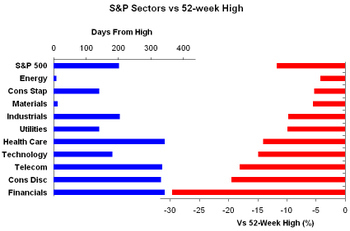 The chart below highlights the percent different between the market and sector's current prices and their 52-week highs. As shown, financials have declined the most since their peak on 5/23/07, down 29.7%. Also shown is the number of days from the high. 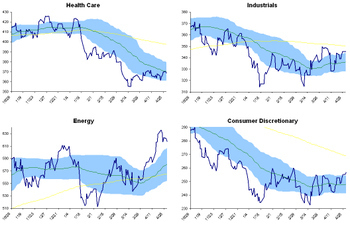 Based on that information the health care, telecom, and consumer discretionary sectors all peaked at about the same time as financials, while energy and materials have set new highs much more recently. 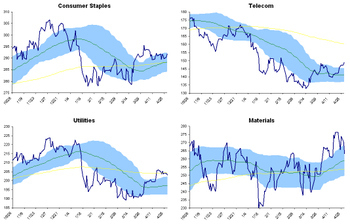 See our previous post for 6mo sector charts and trading envelopes. 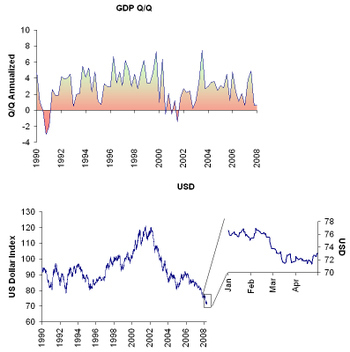 The annualized GDP number came in slightly better than expected this morning (0.6% growth vs 0.5% expected) which was taken as a positive by futures traders (S&P futures promptly traded up 9 points). Oil inventories at 10:30 and the Fed announcement later at 2pm will likely keep volumes low this morning, but some indicators at least have signaled light at the end of the tunnel. The US Dollar index has gained 3.2% since its intra-day low on 3/7/08, a signal that the Fed will soon stop cutting rates. With the dollar and analysts signaling a possible end of the Fed cycle (after today's forecast of a 25bps cut), and the market rallying on the news, long-term prospects for stocks seem good. This of course assumes that the large banks are through the worst of their troubles. Published monthly, Mr. Birinyi's newsletter, Reminiscences, highlights key views on the market, changes in sentiment, updates on sector information and earnings, in addition to a 30 year market veteran's views and commentary. This week only we are running a RARE special on annual newsletter subscriptions. Subscribe today and pay only $190 for the year, that's 15% of the annual rate and 30% off the monthly rate. Call 1-800-357-4468 to subscribe. Birinyi's team also maintains three newsletter portfolios, conservative and growth are ten stocks each, the trading portfolio is five stocks (stop loss and objective limits are detailed). The performance is measured since the last publication, we note that the Growth portfolio has gained 9.23% during the month, and Trading is up 7.92%. To subscribe at the special annual rate of $190 call our office toll free at 1-800-357-4468. With talk of a possible bottom, definite strength in the US stock market, and potential reversals from technology and consumer stocks, we revisit a favorite measure of Birinyi Associates. 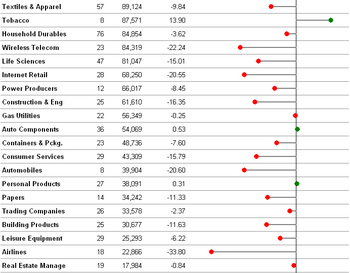 Below we highlight the trading envelopes for the S&P 500, DJIA and the ten S&P 500 economic sectors. 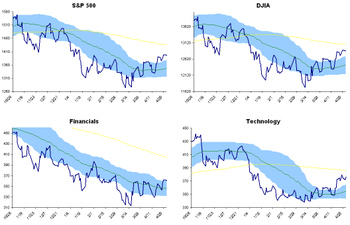 As shown, technology and financials, which had been in steep declines, are now both more than 10% off their lows. The consumer discretionary, health care, and utilities stocks remain in a bearish cycle (10% or lower off their highs and less than 10% above their lows). As of yesterday's close, sectors that are overbought include: S&P 500, DJIA, financials, technology, industrials, energy, consumer discretionary, telecom, and utilities (7 of 10). 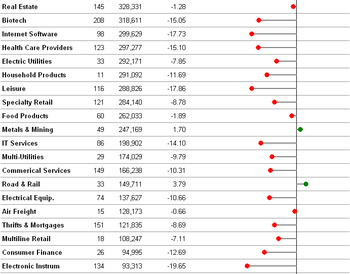 Health care, consumer staples and materials are neutral, no sectors are oversold. When the market and more than half of the sectors are overbought there is reason to be cautious, that situation does not usually provide a short term buying opportunity. Bill Miller recently signaled "The end of the panic," Barron's "Feels Good," and Lehman's Ian Scott thinks "These first-quarter numbers ought to provide fuel for a further rally in the market." Amid the hopeful outlooks, what does Laszlo Birinyi think? For the next three days Birinyi Associates will be offering a discounted annual subscription to Mr. Birinyi's monthly newsletter: Reminiscences. Subscribe now and and receive a 15% discount off the annual rate of $225. That's one year of Reminiscences for only $190. This offer is only good until Wednesday, April 30th at 5:30pm (publication deadline), and only available over the phone. Call us today at 1-800-357-4468 or 203-341-0833 and receive your first issue on Wednesday after the market closes. 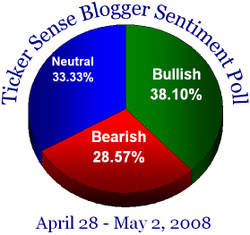 This week's poll is bullish by a small margin. 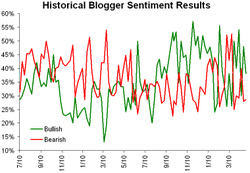 Be sure to check out Declan Fallon's latest "Blogger Analysis" here! Legg Mason's value fund manager Bill Miller released his quarterly letter to shareholders this afternoon. Highlights include his view that the Bear Stearns sale to JP Morgan represented the "culmination" of the financial crisis. In his view the sale ended a period of panic trading (volatility), although broader economic consequences will take longer to digest. Although the letter is mostly geared towards current investors in his fund, it is public and in available in its entirety here. Using the same universe for the U.S. investable market (excluding stocks that did not trade between 12/31/07 and 4/22/08) as the following study, we break down performance by industry below. 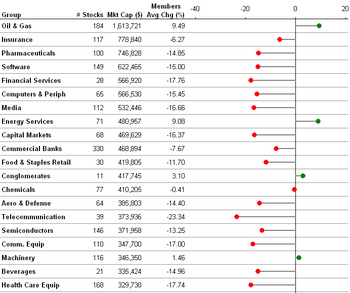 The figures as shown are sorted with the largest group at the top. 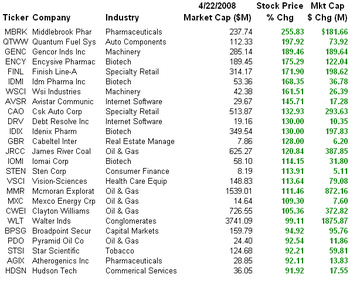 Oil & Gas, having a market capitalization of $1.6 trillion and consisting of 184 stocks, has been one of the best performing groups this year, with the average member up 9.49%. The stocks doing best on average are the 8 stocks in the Tobacco group, which has a market cap of $87.5 billion (note that only Altria's market cap of $46.5b was included, Philip Morris International was excluded from the study). The worst stocks have been Airlines, those 18 names were down 33% on average, and the average U.S. stock is down 9.9% for the year.